'Dune' OGB- (Ben Hager, R. 1981). Seedling AR3368Gd. AB, height 28" (71 cm), Early bloom season. 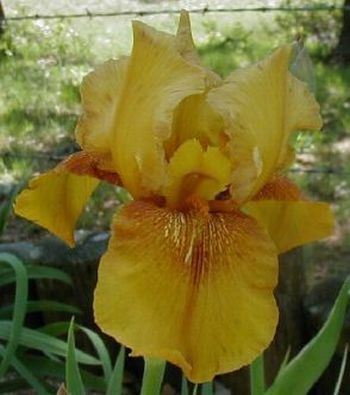 Smooth bright brassy gold with gold brown blending and veining around bronze orange beard; darker stripes from end of beard down petal. AR2841B: ('Persian Market' x 'Welcome Reward') X 'Prosperity'. Melrose Gardens, 1981. Honorable Mention 1983; Mohr Award 1985.